In this post I introduce some of my collage and related works. I don’t have many of them. I tend to begin using sketchbooks then just stop. 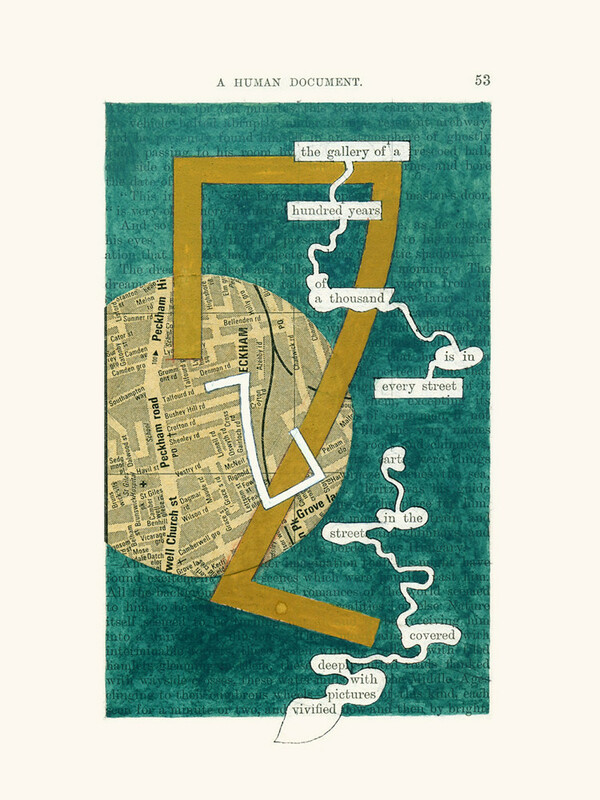 I couldn’t begin this post without mention The Humument by Tom Phillipps. In this video, Phillips talks about his lifelong project. He transforms a Victorian novel into the most beautiful artefact. Listen to Tom Phillips talking about his book. I have an i-Pad app (costs about £6.99) where you ‘spin’ an Oracle and two pages of The Humument appear. You decide from those what message you want to take away for the day . There’s no substitute to owning the book though – I believe there is an updated edition which I intend to purchase. You can hear Phillips reading from The Humument here. Phillips work must have been in the back of my head when I made my own – in a much cruder way. In the foreground , a black and white dog, sitting looking at me. I liked using different coloured paper. The best line that came out of the collage process is the title of this piece. I’m giving them titles as I type. Below is a page from another notebook. The intention was to incorporate a bright image in the middle of a black strip on every page and write around it. I didn’t get very far.Ah well! “Spring” was the theme of a making/writing workshop I led with an artist. I worked on a collage as the participants did theirs. It has some lines from John Donne’s ‘Twickenham Garden’ in there. I think I was influenced by Karl Schwitters -his idea of ‘Merz’ where you bring in random scraps and objects. These were made for an Instagram competition which was organised by The Poetry Society and people linked to the film The Quiet Passion. You can read about the winners and see their splendid work here. Brilliant poet/artist Sophie Herxheimer went on to do a whole series and you can see them on her Instagram. Mine weren’t in the same league but I like them and they were fun to do: I write each as a poem too. This one has a background of a long bathroom tile, some paint and tissue paper with cut out figures and headlines. Black card with cut outs,crayon and luxury art papers. Black card, wrapping paper, paint, crayon cut out pictures and headlines. I photocopied these from a book -and the ones in the previous collage. This was made on a course on Poetry and Art led by the wonderful Tamar Yoseloff. We were at The Old Olive Press, Almasserra Vella, the residential centre owned by Christopher and Marisa North near Alicante. I used pages from a magazine and newspapers. Note the American theme. Lastly, for now, a collage made in response to a prompt in an online poetry workshop. I’m not going to write it out. The background is torn from an article on embroidery from the V&A Catalogue. The method is erasure/redaction. I cut out the masks. The background is black paper. `I must press on with these. They can be mined for ideas for other poems. They are fun to do and definitely therapeutic. Why not give them a go? These are amazing Pam. Have you tried sending them to Rise Up Review? 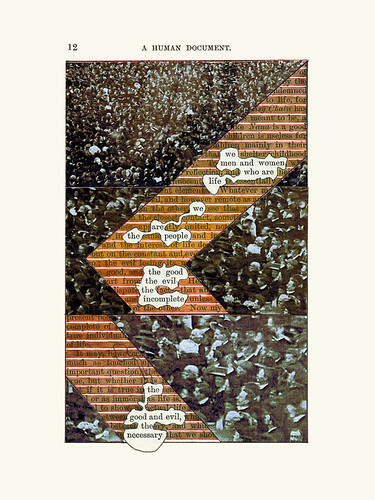 They have some fantastic collages by Kathleen Loomis on their Found/ Erased page. Funnily enough, Ian McMillan was also talking about Tom Philips when I went on his workshop last week. I love the term ‘treated’ – so much broader than ‘redacted’. Anyway, good luck with your project. There’s some beautiful work there. These poems are stunning, Pam. I’m inching my way towards using more visuals slowly slowly and this has big up inspired me. An area I’m going to read more on, thank you for the opportunity to read your vibrant work. Thanks, Ray! I look forward to seeing what you produce – and many congratulations again on your superb MA results ! Thanks Robin. Tom Phillips and Mary Ruefle are both inspirations. I look forward to seeing any new visual work of your own.